I've been looking for tags to participate in and the "unpopular opinions book tag" (which was was created by TheBookArcher) seemed fun! 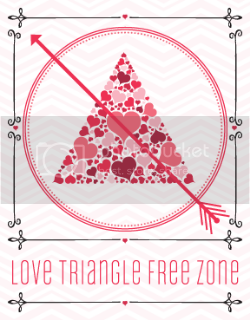 I don't tend to read books with love triangles, but I did not see this triangle coming. I was so annoyed when Juliette and Warner from the Shatter Me trilogy by Tahera Mafi became a thing. Even more so because to me it felt like originally the author intended Adam/Juliette to be a couple, but then suddenly after book 2 she changed her mind. Adam's character did a complete 360 and became completely unrecognisable in the novella from his POV, Fracture Me. I was so enraged by it and also the final book in the trilogy, Ignite Me. I prefer for love triangles to be up front, so I can avoid/DNF the book and not waste my time getting invested in the series. You can read my rant review of the novella from Adam's POV here if you're interested. The Darkling from the Shadow and Bone trilogy. I know a lot of people ship him with Alina, but to me he is a villain. I can't see him as a love interest considering everything he's done. The Throne of Glass series by Sarah J. Maas. I know for sure I would not be able to get on with the mc and the romance sounds like a hot mess. Under the Dome by Stephen King. I've never been interested in reading the book, but my sister and I loved the TV show. Yes, enough with the love triangles and insta-love! I liked Ruin and Rising overall but there were definitely parts of it that I would have liked changed. And you hate the Darkling?! How dare you, lol?! That love triangle in Shatter Me. I honestly like Warren over Adam in terms of character interests but when he became the love interests, I just don't see the point. I hate how Adam was suddenly given a bad guy attitude (not that I'm a fan of him or anything) and Warren's actions were given unreasonable justification. it basically ruined the series for me. I've only read 2 books form ToG and I like it. The romance is such a mess, that's for sure, but the books as they are, kind of work for me. But I'm not raving about it as much as everyone else.